Rajasthan Royals 3-148 (Sanju Samson 54, Ajinkya Rahane 33, Stuart Binny 27, Rishi Dhawan 1-17) beat Mumbai Indians 7-142 (Rohit Sharma 44, Kieron Pollard 42, Vikramjeet Malik 3-24) by seven wickets. Mumbai Indians scored 142 runs with three wickets in hand at the end of the measured 20 overs and Rajasthan Royals piled up 148 for the loss of just three wickets and two balls still in hand. 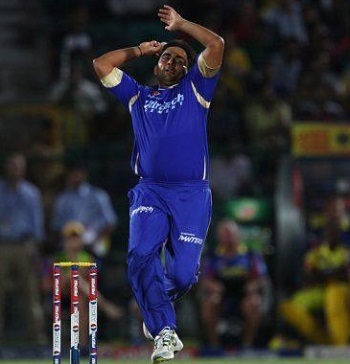 Vikramjeet Malik (Rajasthan Royals) was declared ‘Player of the match’ for his excellent bowling spell of 3-24. The first match of the Champions League Twenty20, Group A was played on Saturday, September 21, 2013, at Sawai Mansingh Stadium, Jaipur. Earlier, Rahul Dravid, the skipper of Rajasthan Royals, won the toss and sent Mumbai Indians in to bat. Dwayne Smith along with the little master, Sachin Tendulkar, opened the innings and the first was gone at 9. Dinesh Karthik walked in next as Tendulkar hit 2 fours in the third over and took the score to 26. Karthik was clean bowled by Vikramjeet Malik for just two runs as Tendulkar became the next victim 12 runs later for 15. Mumbai Indians were in trouble at 4-43 in 8.1 overs when their captain Rohit Sharma and Kieron Pollard stopped the invasion of the home bowlers. The runs started pouring in as Sharma hit the first six of the day in the 13th over and the batsmen added 13 runs two overs later with a couple of fours. The partnership was broken at 95 when Rohit Sharma was caught behind by Sanju Samson off Shane Watson for 44 from 37 with 2 smart sixes and 3 fours. Pollard hit 2 sixes and 2 fours in the following overs and was finally caught behind by Samson off Malik for 42 from 36 with 2 sixes and 4 fours. Mumbai Indians managed 142 runs for the loss of seven wickets after the last ball of the 20th over was bowled. Vikramjeet Malik was the highest wicket taker with three whereas Shane Watson and Stuart Binny claimed one wicket each. Rajasthan Royals lost the first wicket of Rahul Dravid at five when Sanju Samson associated with Ajinkya Rahane. Samson hit two back to back fours in the third over and Rahane got two boundaries in the sixth one. The pair added another six and 3 fours in the coming overs and enhanced the score to 79 in 11.2 overs when the stumps of Rahane were destroyed by Rishi Dhawan for 33 off 31 deliveries with 1 six and 3 fours. Shane Watson took guards next, dispatched a six in the 13th over and Samson reached his second Twenty20 fifty in the 15th one with a four. Sanju Samson was caught by Smith off Pollard for 54 off just 47 balls with 8 fours as the total touched 107 after 15.3 overs. Rajasthan Royals required 33 runs to win the game in the last 24 balls as Stuart Binny replaced Samson. The batsmen continued their attack and were sending the ball out of the fence at regular intervals. Binny hit the winning six on the fourth ball of the final over and held his crease for 27 off just 14 deliveries with 1 six and 3 fours. Shane Watson was at the other end for 27 off 22 balls with 2 big sixes as the hosts hammered 148 with seven wickets available. Nathan Coulter-Nile, Rishi Dhawan and Kieron Pollard were the only wicket taker with one each. 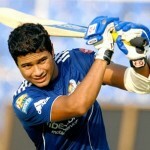 Rajasthan Royals beat Mumbai Indians with a huge margin of seven wickets and earned 4 valuable points. Pitch didn’t favour batting, MI lost as they are more of batting powerhouse than bowling machine. Lasith Malinga’s absence helped RR a bit. It was never going to be easy to bat on grassy pitch.